When you shop for a used car, you can evaluate the condition of the brakes and belts on a test drive. But, a test drive won't reveal if a used car has a rebuilt engine. While new rebuilt engines are equivalent to a new engine, a used rebuilt, frequently assembled from scrap parts, can cause repeated expense and headaches. With the help of a mechanic, methodically inspect any used car you'd like to buy for certain features common to rebuilt engines. Open the hood and look for the VIN or vehicle identification number. The 17-alpha-numeric VIN, according to Department of Motor Vehicles, is the fingerprint or tell-tale identifier of a car. It encodes details such as the car's year, make, model and city of production. Although cars manufactured prior to 1981 were not required to have the 17-character VIN, new cars should have the the number stamped on the engine block. Ask your mechanic to inspect the cylinders. 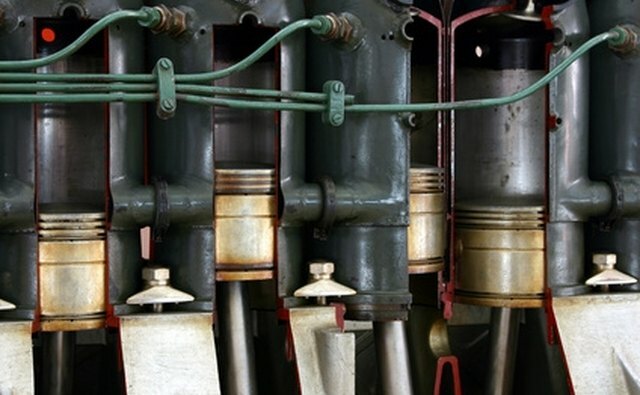 After years of driving, an engine's cylinders can lose their round shape. Before new pistons and rings can be fitted into the cylinders, a mechanic must hone and reshape the cylinders. A used car with high mileage but round cylinders may have a rebuilt engine. Note: While re-honing cylinders isn't problematic, repeated rebuilt can make cylinder walls thin and brittle. Look for new or polished crankshaft bearings. Over time, heat, lack of oil lubrication, pressure, dirt and grit or misalignment can cause the crankshaft bearings to wear. Though normal "wear and tear" occurs over time as the crankshaft rotates, new or polished bearings can indicate that the engine isn't original. Check the engine block and inside frame for tool marks and scratches. Additionally, check for discoloration, new paint, unusually clean valves or rings. Although some drivers are fastidious in their engine care, it could also be a sign that the original engine has been replaced. Ask the seller for copies of maintenance receipts or a service book that chronicles service visits to the service department. If you're buying the car from a dealership, ask for a Carfax Report, which is a mechanical record for the car, especially if the car is a Certified Used Car. Though not fool-proof, Carfax should document any engine work and certainly if the engine has been replaced. Can Black Oil Damage Your Car?